When the medical students weren’t delivering babies, they were studying. And studying meant studying the human body. In other words, they were up to their elbows in corpses .Get the picture? There’s the budding wannabe doctor with his hands in some cadaver’s insides when he gets the call to go deliver a baby. So he rushes off. No surprise. The death rate of the mothers went down. Way down. 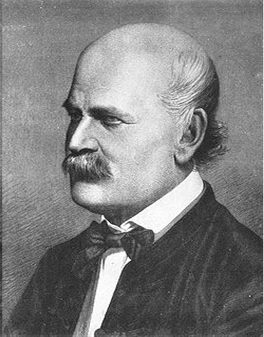 Dr. Semmelweis published his findings with the simple conclusion that doctors should wash their hands. And the medical profession stood up with one voice—and laughed at him. What’s worse, they eventually drove Semmelweis nuts. Dr. Semmelweis battled with his own peers in the medical profession for years. The struggle took its toll, and he was admitted into an insane asylum. He died 14 days later. Too bad Dr. Semmelweis was locked away and never heard what happened. On August 12, 1865, one day before Semmelweis died, Dr. Jospeh Lister in Britain took Semmelweis seriously and began using antiseptic practices in the operating room. Lister proved Semmelweis right, and death from post-operation infections dropped from 50 percent to 15 percent. Standing on Semmelweis ‘ shoulders, Dr. Lister became the father of antiseptic surgery. Semmelweis had one plea that went unheeded for years: “Wash.” It’s a plea that still goes unheeded—but in a whole different sense. We live in a culture that dismisses sin. “Hey, it’s not a sin to me.” Yet we ignore the result of our sin—death—even though Jesus offers a remedy: Wash.
“He saved us, not because of righteous things we had done, but because of his mercy. He saved us through the washing of rebirth and renewal by the Holy Spirit” (Titus 3:5). “If we walk in the light, as he is in the light, we have fellowship with one another, and the blood of Jesus, his Son, purifies us from all sin” (1 John 1:7). I’m glad you wash your hands. But look to Jesus for a cleansing that truly saves you from death. Next Next post: Why Should Kindness Be Random? Great article. Did you know your blog has an ad for Hillary Clinton, a proponent of abortion? Yikes. WordPress says they may place ads on blog sites. It’s how they pay for things, but I will chase down how to get that ad replaced. Unfortunately, because I’m logged in as administrator, I don’t see the ads. Thanks for the heads up. I don’t see any adds either. I never see any adds here, but what you say makes sense because when I am reading the Bible app from ODB, I always get ads from where ever I had recently browsed.